Would it be too corny to say I found a trick that is really a treat? Anyone who knows me is tired of hearing me talk about Pinterest and I shared Halloween Costume ideas from Pinterest last week. This week I got a chance to stop pinning and start doing what I learned there. At our dinners for eight, we have a lot of chicken. We get tired of chicken honestly. PInterest can help with recipes too and I have learned a few that have spiced up our menu. But all the choices in the world don’t take care of the chicken shredding job I always dread. chicken chopping for eight is no fun. If you wait for it to cool it toughens up and if you work while it’s hot, well, it’s too hot. All that is behind me now however, thanks to this tip. I nearly cried, not gonna lie. the big catch is, you need to have a big electric mixer with the paddle attachment, but for big families this is not a neglected appliance. It has paid for itself. 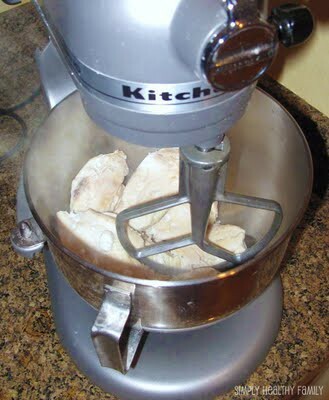 If you have the mixer, all you need is some cooked chicken breast, still warm, and dump them in the bowl. 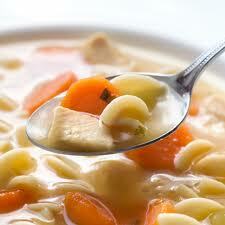 I cooked mine from frozen by putting them in a pot with onions, celery, salt, pepper, garlic salt, and thyme. That’s it. I put in all the chicken in, no trimming or fussing over it. Then turn on your mixer and watch the magic happen. You are left with the most perfectly shredded chicken, ready for all kinds of recipes. Maybe you have to have chopped 20 years worth of chicken to find this as exciting as I do. I did go back through the bowl and find the connective tissues that are usually found in chicken breasts. They were easy to pick out because everything else was so perfect.I made a casserole of mine with the broth that was left in the pot. It would also make amazing soup. I hope this tip makes you as happy as it makes me. I can’t wait to see what I learn this week! 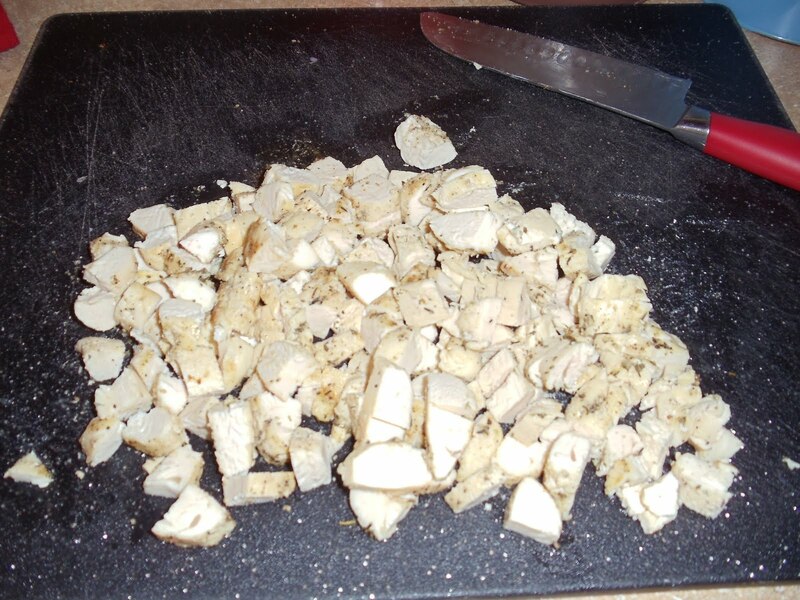 This entry was posted in just for fun and tagged kitchen short-cuts, Pinterest, tips for shredding chicken by lookmom. Bookmark the permalink. Ahhh! I don’t have a mixer…but I want one! And, believe it or not, at age 26 I just had my first chicken shredding experience the other week. It was as not fun as you described it (I actually ended up delegating the task to my husband – haha!). I’ll remember this for when I do have a mixer! What a great tip. Might I ask – how exactly do you boil chicken? And do you always boil it with the onion, etc? I boiled it last time before I shredded it, but I for way too long I think. This is great, and I thought cutting chicken into bite-sized pieces with kitchen scissors was a shortcut! Will definitely have to try this. No, you will never have to do that again. The chicken tastes better when it is cooked whole too, so…bonus!